New brewing innovations are helping craft brewers revolutionize beer consistency, efficiency, and aroma with highly concentrated forms of downstream hop product lines. 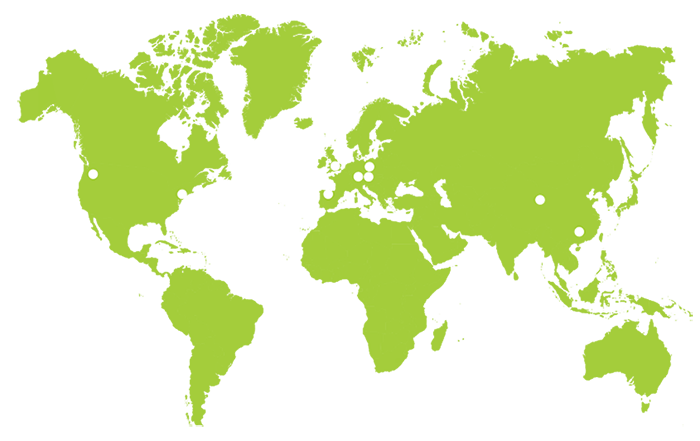 Hopsteiner, one of the foremost hop-growing, trading, breeding, and processing firms in the world, is leading the way in the production of several new innovative hop products to answer the demand of craft brewers. At Hopsteiner, we work hard to always stay ahead of what brewers and consumers are looking for while anticipating new trends. Our popular downstream product line is the result of successful research and extensive trials to achieve the perfect outside-the-box tool for creating an incredible tasting beer…with consistency. Most people associate hops as just a flower that gets boiled down to make beer and for the past few centuries that has been their primary use. However, in recent years, new applications for hops added at different ends (of the hot and cold side) of the brewing process have not only created new beer styles, but new brewing methods for extracting flavor and aroma from the ingredients used. In a similar fashion, we have taken hop cones and extracted the natural resin compounds from hops via carbon dioxide (CO2) to create a product called CO2 Hop Extract. Extracts retain the hop’s α-acids, β-acids, essential oils, aroma and bittering characteristics found in a leaf hop, but at a super critical level of potency. Hop extracts are highly-concentrated hop additions that provide convenience, efficiency, stability, consistency and flexibility to brewers. Hopsteiner’s Hop Extracts also possess antibacterial and antioxidant properties. These special hop products can be used for brewing and beyond. Many of our products have been used as processing aids for industrial fermentation as natural aromas in foods, animal feed, and as antioxidants in cosmetics. And we are just scratching the surface with the amount of potential applications. 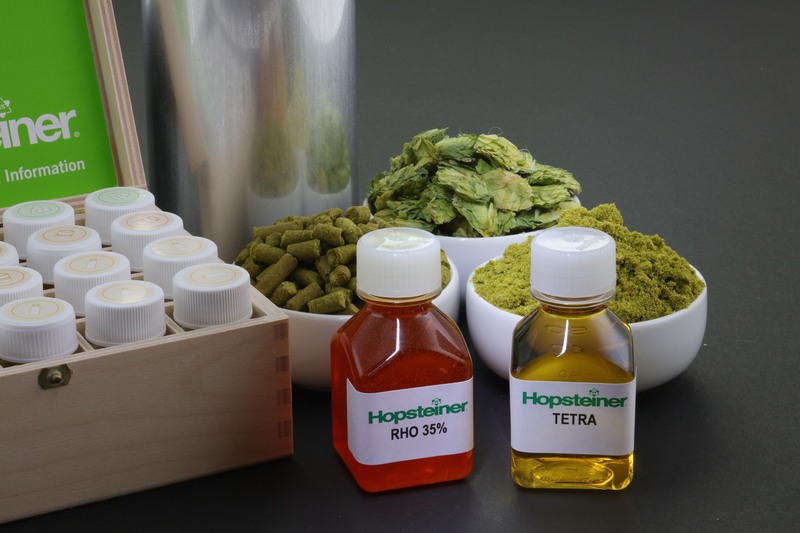 Hopsteiner offers a full-range of innovative hop products in addition to the CO2 Extract as well as a long list of hop varieties developed from their breeding program. Their unique hop processing technology allows for a great degree of homogenization (regardless of the size to be produced) in order to guarantee consistency, stability, and flexibility for brewers. Pure Resin Hop Extract (CO2-Extract) is produced using soft, supercritical CO2 as a solvent that extracts only the critical resins but eliminates all vegetative matter. CO2-Extract can replace leaf hops or pellet additions in the kettle for improved beer yields. CO2-Extract contains all essential oils and resins. Steam-distilled hop oils are made from leaf hops, and thin film hop oils are made from CO2-Extract. Hop oils offer enhanced hop aroma, greater yields, and better overall consistency. Hop oils are variety-specific and can be used in the kettle, fermenter, and even post-fermentation. Beta Aroma Extract is a concentrated form of CO2-Extract that can enhance hop aroma. It is best used as a late kettle addition to partially replace aroma leaf hops or pellets. All alpha acids have been removed to explicitly enhance aroma with no added bitterness. Alpha Extract is a pure solution of natural alpha acids produced from CO2-Extract. Alpha Extract improves the stability of beer foam with minimal bitterness. We recommend using Alpha Extract as an addition before final filtration for best results. Beta bio is produced from CO2 extract. It contains primarily the natural β-acids fraction of hop extract dissolved in food grade Propylene Glycol. β-acids are well-known to have potent anti-microbial properties, and are particularly active against Gram positive bacteria and certain algae. Beta bio is typically added to molasses based feed stocks for the production of yeast or alcohol at a 5 ppm dose rate. Will not contribute any added bitterness to beer after yeast pitch. Isomerized hop extract is an aqueous solution of the potassium salts of iso-alpha acids produced entirely from CO2-extract. Iso can be used post fermentation to top-up bitterness or to partially replace traditional forms of bittering with much higher efficiency. Iso 30% is recommended to be added before filtration for best yield results. Tetra Extract is a concentrated form of tetrahydro-iso-alpha acids that are derived from CO2-Extract. Tetra is typically added after fermentation to greatly enhance foam stability and lacing and can also be used as a partial replacement for traditional bittering hops. The exclusive use of Tetra also offers the added benefit of complete protection against light struck flavors. Rho is a pure, aqueous solution of the potassium salts of rho-iso-alpha acids produced entirely from CO2-extract. Rho gives protection from light struck flavor when used as the complete source for hop-derived bittering or in combination with other reduced hop products. Rho will provide a smoother, non- lingering bitterness compared to regular iso-alpha acids. Hexa is an aqueous solution of the potassium salts of hexahydro-iso-alpha acids produced entirely from CO2-extract. Hexa will greatly enhance beer foam when used as a post fermentation replacement for a proportion of the regular bittering. In the absence of normal alpha and iso- alpha acid, Hexa will give complete protection against development of light-struck flavors. For more information about innovative downstream hop products and availability, please visit Hopsteiner.com or call 800.339.8410.